Hudson’s RapidHit™ Simultaneous Automated HitPicking System is a compact, self-contained system that allows users to obtain assay plates comprised of the actual hits detected in a primary screen using the same compound source plates that provided the primary screen. The RapidHit uses the output files produced by the plate reader as they become available, and automatically selects and transfers “hits” based on user-entered criteria. As each primary screen assay plate is finished, the RapidHit immediately moves the hits to a secondary assay “hit plate”, and completely eliminates the possibility of receiving the wrong compounds in secondary screening plates. The RapidHit saves the need to return to the users compound storage library to run secondary or conformational screens of the hits in a primary screen. The hit-picked plates are prepared even while the primary screen is taking place, so the secondary or conformational screen can go forward without any delay. And, because the original source compound plates are being used, the secondary assay uses the same compound conditions as the primary screen. This eliminates any artifacts that may result from preparing secondary assay plates anew from the compound library. The RapidHit application software enables the user to establish the appropriate “hit” selection criteria, select the location on the network of the plate reader’s output files, the database where the assay plates are linked to the compound plate IDs, and the desired location of the RapidHit‘s own compound-to-hit well log files. When the RapidHit is running, the user can monitor the hits being selected even while the pipettor is making the transfers. Running in background behind the RapidHit application display is Hudson’s powerful automated workcell scheduler software, SoftLinx. SoftLinx coordinates the operation of the pipettor, the stackers and the barcode scanners to run the RapidHit application seamlessly with the user’s primary screening application. Also running in background is Hudson’s SOLOSoft software, which operates the pipettor and organizes the pipettor’s hit-picking operation. The RapidHit’s abilities can be extended by adding additional instrumentation to further automate the creation of plates that can be read directly by the reader. For example, adding a MicroFlex dispensor, plate washer, incubator, and plate shaker, one can create plates that are ready for most common drug discovery assays (such as FRET, ELISA, AlphaScreen, FP, FI, UV-Vis, etc. Adding a PlateCrane provides total walk-away screening and re-screening capability. 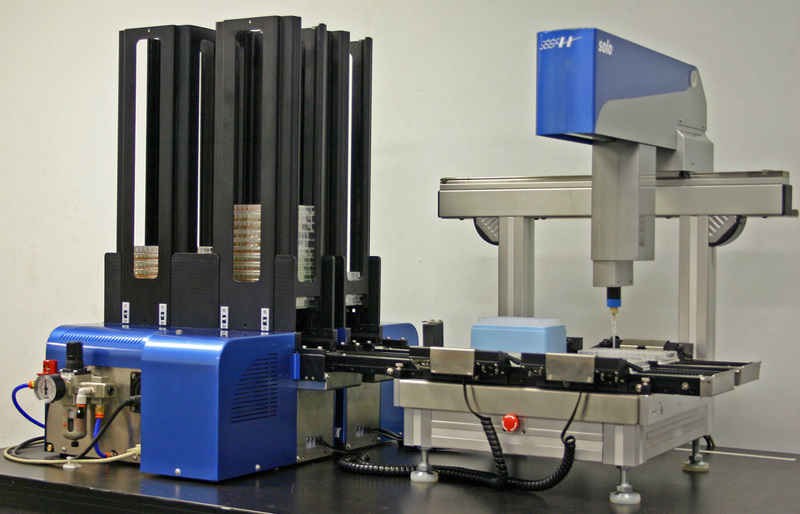 The RapidHit consists of a set of automated plate stackers and a compact robotic pipettor, all controlled by a system computer that links via Ethernet to the user’s database. After the assay plates for the primary screen have been prepared, the user loads the source compound plates, containing the excess compound volumes that were prepared in the user’s compound library, into the RapidHit’s stacker. RapidHit software then monitors the database for the presence of primary screen reader output files. As these become available, the RapidHit automatically finds the corresponding compound plate and moves it onto the robotic pipettor. A “hit plate” is also dispensed onto the robotic pipettor, along with a rack of disposable pipette tips. The RapidHit software then proceeds to read the primary screen output files, determine those wells that produced hits, then transfer a user-prescribed amount of compound into the hit plate. When it is done with the compound plate, it is returned to the stacker, and the RapidHit awaits the results of the next primary screen assay plate. It repeats this process until all the primary screen assay plates have been read and their hits concentrated on hit plates in the RapidHit. The user can then unload the hit plates and go directly into a secondary or confirmation assay. The RapidHit is compatible with virtually any microplate reader that is used today in screening labs, and brings HTS to a new level of efficiency. The RapidHit consists of a set of automated plate stackers and a compact robotic pipettor, all controlled by a system computer that links via Ethernet to the user’s database. After the assay plates for the primary screen have been prepared, the user loads the source compound plates, containing the excess compound volumes that were prepared in the user’s compound library, into the RapidHit‘s stacker. Two Hudson StackLink stackers, with associated tracks and plate detection devices. One system control computer, with Ethernet LAN connection and 5 RS-232 ports. The RapidHit can be located anywhere there is bench space in the user’s lab. It only needs access to utility connections (120 VAC power and 80 psi air) and to an Ethernet connection to the user’s server where plate reader output files are saved.